Walking into a relative’s house during Chinese New Year is akin to walking into a lion’s den. Only that in this case, you’re the lion. And the snacks are at your mercy. By now, it is common knowledge that these snacks aren’t exactly doing us any favors of staying slim and trim. Let us walk you through how to pick snacks that will have minimal impact on your fitness goals, so that you can take comfort in the fact that you tried (at the very least). The rich, buttery and oh-so-decadent pastry makes it one that we absolutely love. Unfortunately, it has a crazy amount of butter in it which takes a single slice of kueh lapis to 157 calories! We’re talking about the plain ones here, people. For those with prunes in it…we don’t even want to think about the calories in that. Guess what- you’ll have to climb a 100 flights of stairs just to burn off that one slice! We don’t want to spend our CNY running up and down the stairs, so we’ll go with pandan cake instead. Pandan cake is a type of chiffon cake, with a light and fluffy interior. Light in texture and lighter in calories as well, a slice of this sweet treat comes up to 93 calories (for a 39g serving). In terms of calories, pandan cake is a sure win. 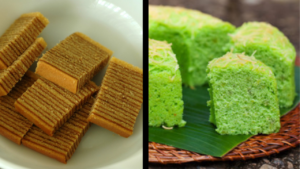 While both may not be the healthiest foods, choosing pandan cake over kueh lapis will save you quite some calories. Less running to do after CNY! Deep fried crab stick strips are similar to a celebrity in hiding. We rarely see them around, but during Chinese New Year they’re everywhere! Like any sane human will do, we make sure to eat our fill when they appear. To our dismay, we found out that crab sticks are imitation crab. Deep frying it adds extra sinfulness to this snack. These are not only empty calories, but are also filled with artificial flavourings and colours. At least potato chips are made from real potatoes. 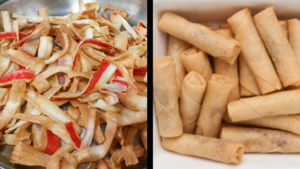 Dried shrimp rolls, or also known as hae bee hiam rolls, seem to be made for snacking. They’re compact and gives that satisfying crunch when you bite into it. If you’re craving that crunch, go for these instead. These are bursting with flavour, so a few would be more than enough. One of these rolls contain 23 calories, so it’s well within your daily intake if you don’t go overboard. It also contains shrimp, which provides that extra protein you need. How could we fail to mention the symbolic pineapple tarts? A favourite of many, the container will probably be empty by the time you leave the house. It should be healthy since it is a pineapple tart. And after all, aren’t fruits healthy? 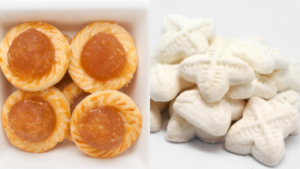 When it comes to pineapple tarts, not really. Pineapple fillings get its sweetness from sugar syrups and other flavourings added in there. Pineapple tarts are inconspicuous looking, but are calorie dense. A single piece sets you back by 93 calories. If paradise could be described as a taste, this would be it. This snow-white pastry melts in your mouth, leaving behind a lingering sweetness that will have you longing for another. This is one of the snacks on the table that does the least calorie damage at 15 calories a piece. This is lower in sugar as well, and won’t spike your blood sugar levels. You’ve heard of the benefits of these nutritional powerhouses. But do you know the differences between them? For example, melon seeds are lower in fat content (39g in 100g) as compared to peanuts (49g in 100g). Suffice to say, both seeds are rich in fibre, protein and antioxidants. A handful of them keeps you full, keeping you from overindulging. 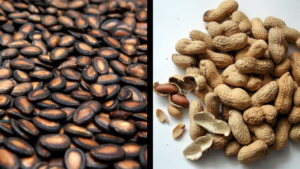 However, you might want to go for melon seeds over peanuts if you’re watching your intake. You’ll be able to shave off 300 calories by doing so. Be mindful and choose seeds that are roasted, baked or raw. Avoid ones that are coated in sugar, honey or salt. CNY treats are bound to be stored in big containers just lying around. Portion out some for yourself, and leave the rest for others. this way, you won’t be tempted to continuously reach for more. Even if you are limiting your intake of CNY goodies, your sugar consumption is most likely going to be over your daily intake. To ensure that you don’t take in any more sugar than you need, avoid sugary drinks. At the very least, go for drinks lower in sugar. Some popular choices would be green tea, if not plain water. With these approaches in mind, we hope you’ll have a happy, healthy Chinese New Year ahead!